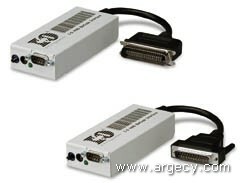 Standard connectors allow the attachment of virtually any parallel or serial bar code label printer to an IBM AS/400, S/3X, or 3270-type mainframe host, or to a controller. Compact design turns any attached printer into a seamless, stand-alone twinax/coax printer. The I-O 4440 has an extremely low power requirement (about 1/2 watt). This not only saves on power costs, but allows the I-O 4440 to draw it's power from pin 18 of the parallel port, or pin #14 of the serial port, if the printer supports this option. This means there is no need to find an additional power plug, or decide where to put the power supply.